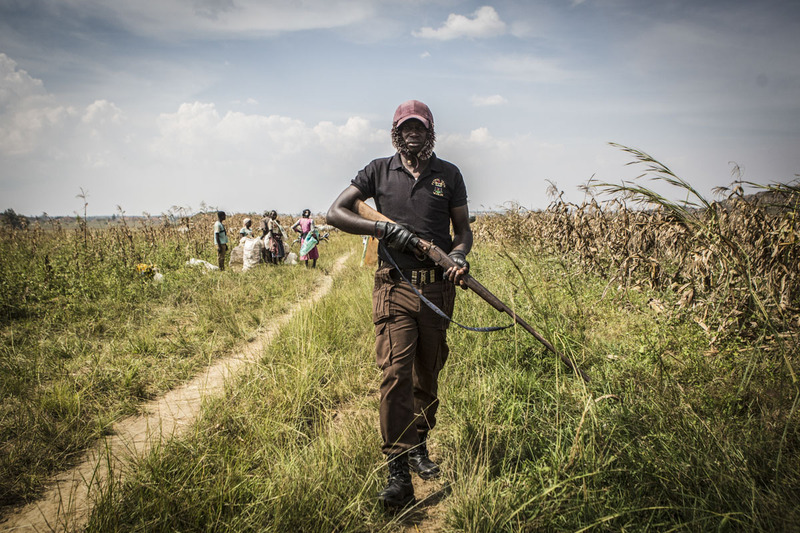 Barkin Ladi, Jos, Nigeria- A member of the Vigilante groups of Nigeria, Barkin Ladi Division walks along side a maize field in Barkin Ladi, Nigeria on Wednesday, October 24, 2018. Vigilantes were called by farmer Amos Lenji after he confronted a group of herders who allowed their cows to graze in his maize farm that was not yet harvested. After one of the young herders threatened the life of Lenji, herder Muhammed Yusuf came forward to take responsibility for the actions of the other herders. Over one thousand people have lost their lives this year due to an ongoing conflict between farmers and herders. The current crisis reflects the country's woes from over-population, poverty and climate change to religious division and ethnic favoritism. Growing animosity between ethnic groups coupled with a lack of security has fomented this increase in violence in recent years. Despite the divisive chaos engulfing the Middle Belt of Nigeria, a group of multi-ethnic men and women, part of the Vigilante Group of Nigeria, are providing much needed security and trust to all groups affected by the conflict.